Luzianne Medium -Dark roast coffee and chicory is a smooth and flavorful coffee. The chicory added to the coffee helps mellow the coffee blend and removes the bitterness. 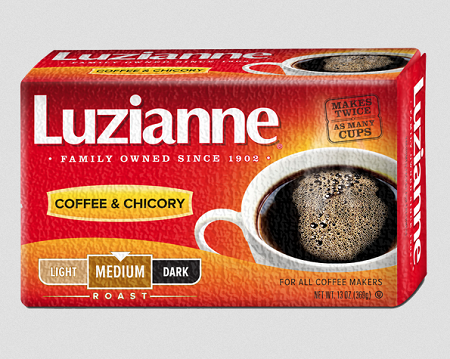 Luzianne Red Label coffee and chicory has been a Southern favorite for more than 60 years. Also know as Reg Bag Coffee. Discount if you buy 12 or more cans taken automatically during checkout. Luzianne Premium Blend Coffee & Chicory 16 oz. Luzianne Dark Roast Coffee & Chicory Bag, White Label, 13 oz. French Market Coffee & Chicory Restaurant Blend, Medium-Dark Roast, 12 oz. Luzianne Family Tea Bags, 48 ct.